Campaign ASU 2020 aims to educate community about value of private support. Wide-ranging comprehensive campaign is about gifts both large and small. 55,600 students have already benefited from scholarships during the campaign. Developing an Ebola treatment. Caring for a city’s homeless population. Opening pathways to higher education through scholarships. Such accomplishments take intelligence, compassion — and generosity. To make possible more such life-changing actions, Arizona State University is embarking on a comprehensive campaign to raise at least $1.5 billion to accelerate its mission. ASU President Michael M. Crow said the campaign comes at a pivotal time when the university is reflecting on its successes and building on that momentum. “Campaign ASU 2020 is our moment in time to say, ‘Yes, we’ve been able to do that. Look at who we are.’ It’s not just the faculty and it’s not just the students and it’s not just the staff. It’s the hundreds of thousands of people and the thousands of organizations that are behind us to move this university forward,” he said. The campaign has been in a “quiet” phase since 2010 — with $1 billion already raised through donations by corporations, organizations and, especially, individuals — 260,000 individuals have contributed so far, and 55,600 students have benefited from scholarships during the campaign. Campaign ASU 2020 officially kicked off Thursday night at a gathering of university leaders and supporters. The focus of the night — and the message of the philanthropic effort — is how the work of ASU touches individuals, both on campus and in the community. Megan Phillips, a global health major at ASU, has walked the streets of Phoenix with her fellow students to care for homeless people. She said her work at a downtown shelter and at the Student Health Outreach for Wellness clinic provides hope and dignity to homeless people. “But it also provides students like me the chance to broaden their perspectives and serve the community in a very real way,” said Phillips, who is now the director of programs for the student-run clinic. The clinic is in the midst of raising $5,000 to help further its programs. Read more here. Professor Charles Arntzen, who has saved lives with the Ebola treatment he developed at ASU, said the private funding he received allowed him to try something new and develop it into the leading therapeutic for Ebola. “I can’t tell you how wonderful it feels to be a scientist who started with a crazy idea and ended up seeing that our product saved lives in Africa,” said Arntzen, who is a Regent’s Professor and holds the Florence Ely NelsonThe Florence Ely Nelson Presidential Chair in Plant Biology was created by created by an endowment from Florence Nelson, who, Arntzen said, "gave me the freedom to explore blue-sky ideas that would typically be considered too risky for conventional grant programs. Florence’s visionary investment ultimately led the way to our discovery of ZMapp, today’s most promising drug treatment for people infected with Ebola." Presidential Chair in Plant Biology. Crow said that ASU produces change at a huge scale, but it starts with individuals. “It’s these people who are going to go out and produce these new ideas, produce the changes across the entire spectrum of society,” he said. ASU must pursue larger, more important goals, Crow said, and become the model for future of higher education. “This campaign will allow us to build on the momentum of all that we have established thus far and solidify our position as the first institution to successfully blend this level of academic excellence and egalitarian access,” he said. The university’s very beginning was because of a gift. Donor Craig Weatherup explained that in 1885, local butcher shop owners George and Martha Wilson gave 15 acres of pastureland to build the Territorial Normal School. He noted that two previous fundraising campaigns, in the 1980s and the 1990s, both exceeded their targetsIn the 1980s, the Centennial Campaign set a goal of $75 million and raised $114 million, and in the 1990s, when the campaign set a goal of $300 million and raised $560 million.. When the Arizona Legislature decreed that the proposed Territorial Normal School must be built on privately donated land, no one thought it would come to fruition. Martha and George Wilson defied expectations. Though they weren’t wealthy, they donated the pasture land that supported their butcher shop, and the seeds for ASU were planted. In the '30s, the Bulldog Boosters raised funds for the Arizona State Teachers College athletics. By the '40s, the mascot had gone from Bulldog to Sun Devil, and the Sun Angel Foundation was formed by local business leaders to boost Sun Devil athletics after a disappointing defeat in football to the University of Arizona. Hired as director of special services, George C. Yates brainstormed with President Grady Gammage for many years to establish a foundation as a resource of support for the university. By 1955, the Arizona State College Foundation opened its doors, ushering in a new era of transformation for the rapidly growing university. After the name officially became Arizona State University, President Gammage announced, “Now is the time to decide whether we shall build here a university greater than tax funds alone can build.” Gifts flowed in the following years establishing KAET-TV, boosting the engineering department and opening Grady Gammage Memorial Auditorium. By the '70s, President J. Russell Nelson and ASU Foundation's Lonnie Ostrom recognized the need for private funding. Their goal for the first large-scale capital campaign: $75 million. Campaign for ASU raised $114 million, generating new scholarships as well as erecting institutions like Nelson Fine Arts Center. President Lattie F. Coor launched the ASU Campaign for Leadership inspired by old and more recent gifts, like Barbara and Craig Barrett helping to establish an honors college and adding Walter Cronkite’s name to the journalism school. This $400 million effort ushered in a new era of transformation and expansion for ASU in the new millennium. Mary Lou and Ira A. Fulton made an impactful gift to what would become the Mary Lou Fulton Teachers College and the Ira A. Fulton Schools of Engineering. Not long after, they would make the single largest gift in ASU history, significantly endowing these schools and college, as well as launching ASU’s Decision Theater. William Polk Carey, head of a New York investment firm, made the second largest gift to any U.S. business school, an endowment that would help push W. P. Carey School of Business to high national rankings. Later, Sharon Dupont McCord and her late husband, Bob, gave a gift to help build McCord Hall at the business school. Julie Ann Wrigley’s gift helped bring the emerging field of sustainability to the mainstream, first through the Julie Anne Wrigley Global Institute of Sustainability, and then with ASU School of Sustainability — the first school of its kind. A later gift from Wrigley helped recruit leading scholars in the field to the school. Cathy Dickey and her late husband, Verde, made generous gifts across many areas of campus and Sun Devil Athletics. Their contributions not only helped elevate the nationally recognized Sun Devil Marching Band but also erect the Verde Dickey Dome, a now iconic air-conditioned Sun Devil Football practice facility. Jeanne and Gary K. Herberger’s generous gifts would not only endow and help merge five schools including design and media, performance, music, and film under the Herberger Institute for Design and the Arts, but also established the Gary K. Herberger Young Scholars Academy at the West campus to help nurture gifted middle school students. “Of course, it’s important to note that we didn’t arrive at this point overnight,” said WeatherupCraig Weatherup is an honorary co-chair of ASU’s President’s Club., former founding chairman and CEO of Pepsi Bottling Group Inc. The Weatherup Family Foundation has funded several initiatives, including the Weatherup Center indoor practice facility and training center for the university’s varsity basketball teams. He noted other significant donors who have transformed ASU, endowing colleges, launching research centers, building facilities and funding student activities such as the Sun Devil Marching Band. In addition to fundraising, Campaign ASU 2020 is about educating the community to the value of private support while engaging alumni and friends with the university. $441 million to fuel discovery, creativity and innovation, paying for research, labs, equipment, entrepreneurship opportunities and art galleries. $258 million to drive Sun Devil Athletics competitiveness by increasing scholarships and academic support, adding sports and an Olympic Village on the east side of Rural Road that will include tennis, softball, track and field, soccer, lacrosse, wrestling, gymnastics and volleyball facilities, as well as an Olympic Village-style space for student-athletes. $233 million to elevate the academic enterprise by funding endowed professorships, faculty fellowships and artist-in-residence programs. $220 million to ensure student access and excellence, including scholarships based on need and merit, as well as helping students make progress toward graduation. $184 million to champion student success, which funds students’ learning in real-life situations, study abroad and leadership development. $165 million to enrich our communities, enabling ASU students to participate in local projects, performing arts and public television. Private support is not a replacement for the university’s other sources of revenue, including investments from the state, students, their families, faculty, staff and research grants. Private support provides the margin of excellence that enables the “extras” that shape excellent, meaningful and impactful university and research experiences. The campaign, which is being guided by the ASU Foundation for a New American University, is emphasizing the importance of small gifts, noting that in one year, more than 100,000 individual donors gave a total of $215 million that affected every college and school at ASU. Donors can choose where to giveMany donors choose to restrict their gifts to a certain use or distribution schedule, which can include estate gifts and endowments. Accordingly, many funds raised during the campaign will not be available for immediate spending and will not apply to the university’s yearly operations budget., and ASU’s colleges have set priorities. For example, the W. P. Carey School of Business hopes to raise at least $150 million to fund student scholarships, summer programs and research centers, and to endow faculty chairs and professorships, including one named for Loui Olivas, which would be the first chair named for someone of Hispanic descent at any top 30 business school in the U.S. Some Campaign ASU 2020 projects would far exceed the boundaries of campus, including creation of “The Culture Lab of the Americas,” a $30 million, 45,000-square-foot building with state-of-the-art classrooms, research labs, event spaces and ASU Art Museum gallery space that will connect artists and designers with practitioners across disciplines. The Culture Lab will be located near the Phoenix Art Museum and Heard Museum and will offer advanced degree programs and research centers through the Herberger Institute for Design and the Arts and the College of Liberal Arts and Sciences. 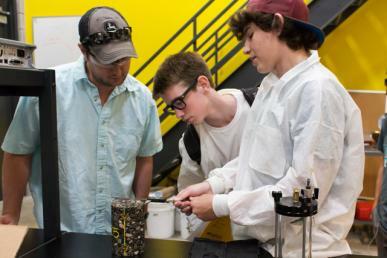 ASU emphasizes projects that cross disciplines, and Lee Hartwell, a Nobel laureate and professor at ASU, spoke about how today’s students will enter a world that’s almost unimaginable now due to rapid technology changes. “So, we have to do things differently — and we are. I believe that ASU is leading the way,” said Hartwell, who won the Nobel Prize in Physiology or Medicine in 2001 and is the Virginia G. Piper Chair Virginia G. Piper Chair of Personalized Medicine is funded by a donation by the Virginia G. Piper Charitable Trust.of Personalized Medicine and co-director of the Biodesign Institute's new Center for Sustainable Health. He has appointments in the colleges of education, biomedical engineering and sustainability, and that gives him the chance to work with diverse colleagues. For example, in the Mary Lou Fulton Teachers College, he is collaborating on a course called Sustainability for Teachers, intended to make the topic dynamic and inspiring. “We think this is an important first step in educating the next generation on the very real challenges they face,” he said. Donor Leo Beus described how moving it was to see the effects of his gift. He and his wife, Annette, established the Beus Family New American University Scholarship to support incoming freshmen or community college transfer students who are members of The Church of Jesus Christ of Latter-day Saints. The couple then were able to interview the students who received the scholarships. “We had the experience of looking them in the eyes and telling them not to worry because their college tuition was covered — and we knew our investments changed lives,” said Beus, co-founder of Beus Gilbert PLLC. They also supported the Beus Center for Law and Society, the new downtown Phoenix home of ASU’s Sandra Day O’Connor School of Law. The center was designed to also house the nation’s first teaching law firm, a law library open to the public and a legal triage service to help the public find legal support. Jackson Dangremond, president of the Undergraduate Student Government on the Downtown campus and a junior majoring in health care innovation, noted the donations that have already been made. For more about Campaign ASU 2020, visit giveto.asu.edu. Want to learn more about what a comprensive campaign is and why a public university needs private support, read the campaign primer from the experts at the ASU Foundation. 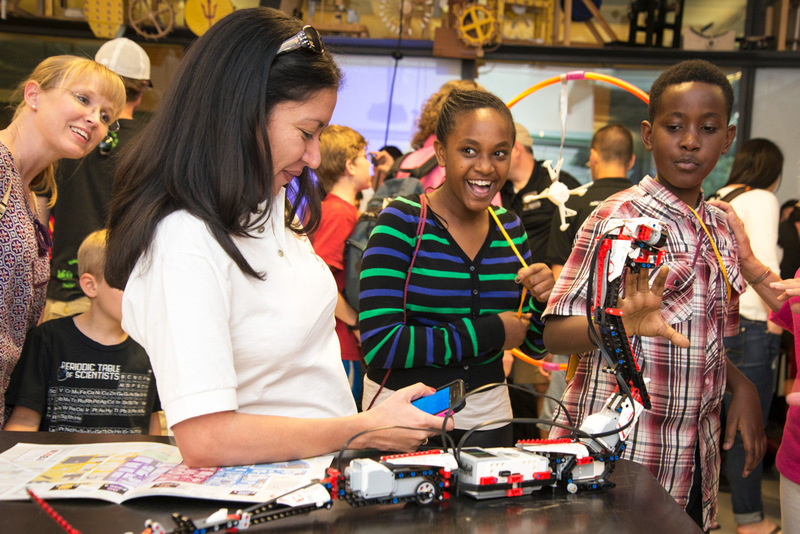 ASU Fulton Schools outreach benefited thousands in 2016: What will 2017 bring? 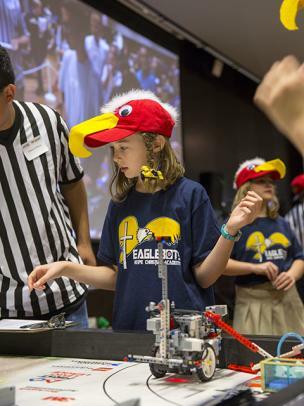 In 2015-2016, the Fulton Schools also continued to invest in Arizona FIRST LEGO League (FLL) programming. As part of the summer academy, the Fulton Schools hosted FLL Jr., Intermediate and Introduction summer camps, including a girls-only camp. The Fulton Schools kicked off 2017’s outreach efforts on Jan. 14-15, with this year’s state tournament, turning out even larger numbers for the event themed, “Animal Allies.” The tournament featured 96 teams, and both of the winnings teams were all girls’ teams.